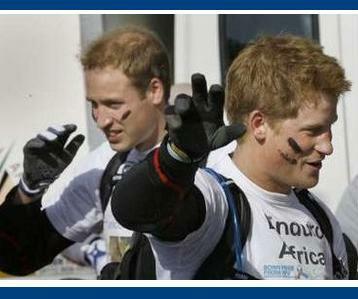 The royal brothers set off on an adventure Saturday, joining some 80 people on a motorbike ride across South Africa, from Durban to Port Elizabeth, over the course of eight days, covering a distance of 1,000 miles. The princes spoke to reporters about the trip that organizers have called an “endurance test” across rocky and dangerous terrain while they are sitting on Honda CRF 230cc bikes in their protective biker gear. The trip aims to raise money for three charities, including Harry’s own Sentebale cause that helps disadvantaged young people in the African mountain kingdom of Lesotho, as well as UNICEF and the Nelson Mandela’s Children Fund. The princes suited up on Saturday in Port Edward, about 95 miles southwest of Durban, greeting children as they mounted their bikes for the long journey. From Port Edward, they will cover approximately 150 miles per day on the light 200cc Honda CRF 230’s supplied by the organizers.